"In the midst of darkness, light persists." When we realized how dire Mama Hop's condition was; when the doctor told us it was time to look into hospice care, panic set in. Every thought that raced through my mind led back to Leanne. 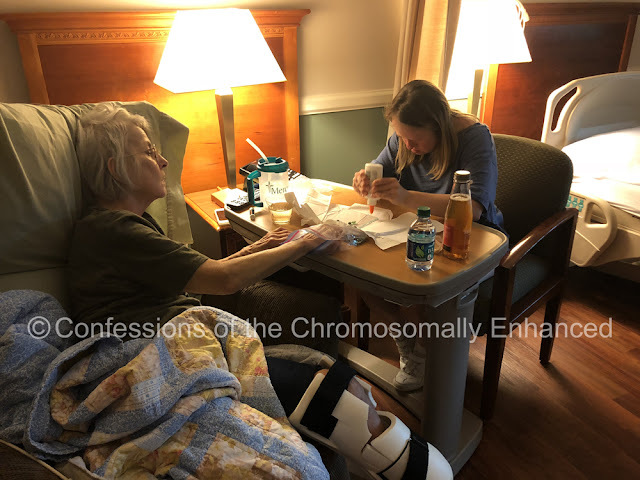 Should she see mom like this or should her last memory be a more healthy version of mom? Should I prepare her that death is imminent or is it unfair to cause premature stress and grieving? I grabbed my mom's "Mental Wellness in Adults with Down Syndrome" and I scanned the index for a chapter that may address this. I began googling things like "Down syndrome and grieving" and "Loss of a parent Down syndrome" hoping that I'd find a step by step guide that told me exactly what to do. I stumbled upon a listing for a seminar on the topic that occurred back in May. There was an email address to register for the webinar and I decided to go for a shot in the dark and sent a desperate email. Within hours, I received a response telling me that the woman who conducted this seminar is on maternity leave but that my email had been passed along to her and she was happy to help. She wanted my phone number. Are you kidding me?! A total stranger from the East Coast who just gave birth and has no obligation to answer an email, yet alone help a stranger was willing to take my hand and guide me through this process?! "For we walk by faith, not by sight . "(2 Corinthians 5:7). 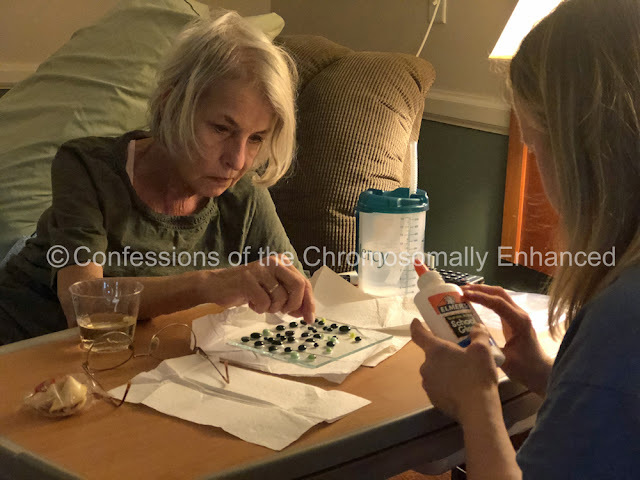 That day, I received a call from Melissa Levin who gave me the following "homework": Find an activity that your mom and sister enjoyed doing together and have them do it. I scanned my brain and mosaic glass work immediately came to mind. Several years ago, after my mom retired from teaching, she attended mosaic art school in Ravenna, Italy. She came back home and mosaiced (is this a legitimate verb? Probably not. Just go with it.) everything in sight: from bowling balls to my kitchen table. It was an obsession! 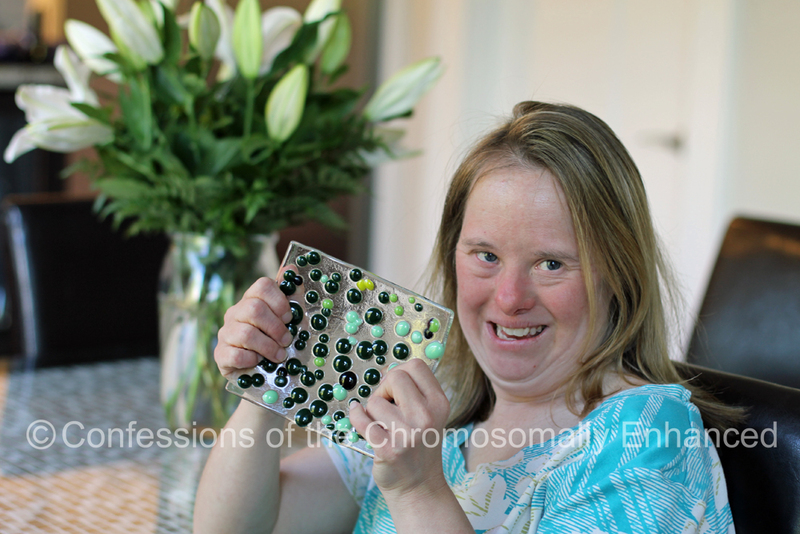 In Leanne's current day program, she cuts glass and creates beautiful works of art. I immediately called her supervisor and told her that while I realized she was incredibly busy with the year's biggest fundraiser happening the next day, is there any way we could create a glass project for my mom and sister to complete together? She stopped what she was doing and set aside a package to take to my mom. That night, when Travis returned from his business trip, Leanne and I left the girls in his care and went to see Mom. We picked up her favorites: crab dip and Pinot Grigio and we gathered around a small bedside table. Together, Mom and Leanne delicately glued glass beads to a small plate. The beads were comprised of various shades of their mutual favorite color: green. That night was a gift. When we returned the next morning, Mom was no longer able to lift her head up off of her pillow. She had rallied to give that last burst of energy to Leanne. It was a beautiful evening; a memory that is forever preserved in this tiny glass plate. Which leads me to another piece of advice offered by Ms. Levin: Ensure that Leanne has a tangible object that calls to mind a positive memory of our mom; something she can hold when she wants to reminisce and feel closer to her mom. I am reduced to tears when I consider how many people went above and beyond to make that night possible for us. This past summer was a heartbreaking journey; witnessing someone you love endure hardship, suffering, and pain is torture. But as heavy as the weight was, and as dark as the journey got, moments of light illuminated our path. Those moments help steer us back to the important focus: the beauty that exists and the blessings that remain. Leanne says that Mom visits her every night in her dreams. She tells Leanne that she loves her and she encourages her to keep praying. Leanne says "Mom is in a better place" and she maintains faith in the fact that they will be reunited someday. For now, Leanne does not dwell on the past, nor does she worry about the future. She exists in the moment and she exudes faith and love. This is a beautiful post Elizabeth and the photos you took to capture the moment brought tears to my eyes. I’m a long time follower of your blog and IG account and was heartbroken when you posted about your mom’s passing. Your stories of her antics always cracked me up and made me think that was the life I’d like to aspire to live when I retire:) There is nothing I can say to help ease any of the feelings of this difficult time for you and your family but know you are in my thoughts and I hope you feel the love from all of your followers. Beautiful. So glad there were moments of light to guide you to the blessings that remain. Thank you for sharing this journey and hugs to you and your family. Thank you for sharing your journey.....your words bring me to tears. I'm praying for your family. This brought me to tears. In awe of the beautiful relationship you and Leanne had with your mom. You have made me reconsider my relationship with my own mother and think about how I can improve it. Keeping you and Leanne and your family in my thoughts. Even though I didn't and don't know you or your mom personally, you have both been an inspiration to me in the years I've followed your blog. This is just beautiful knowing that Leanne and your mom had such a special time. You will persevere and life will go on--as you well know. Please keep living that beautiful life and please know that others are with you in spirit. Oh gosh....your last paragraph and writing about Leanne's faith. What a blessing. Your family and story are such a gift to so many of us "out here". Grateful for what you are willing to share. Praying for all of you. I also look to your mom as inspiration for the awesome woman I want to be when I'm older (especially in a culture that is not as interested in older women as it is in men). I hope your kids are doing as well as they can. I know that, like Leanne, they're very loved. Your creating this moment with your mom and sister was a profound inspiration. Saying goodbye is so very hard. Leanne is a light indeed as are you. May this glass dish be a comfort, as God’s promises are. 1 Corintuans 13:12 kjv For we see through a glass darky, then we shall see face to face. Sweet that Leanne is experiencing this in her dreams even now. What a wonderful way for Leannne to feel close to your mom, and truly Ms Levin iwent above and beyond to help you to help Leanne. I want to acknowledge though, that none of that could have happened without you. During a time that was so very difficult for you, you stepped out of your own fear and grief to do something to help Leanne handle her own. 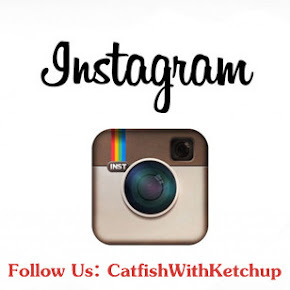 Leanne has her dish, and you have the pictures of the special moments you orchestrated between your mom and Leanne. You are special.